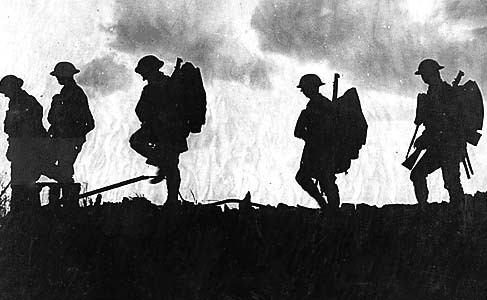 2014 will mark the 100th anniversary of the outbreak of World War One. 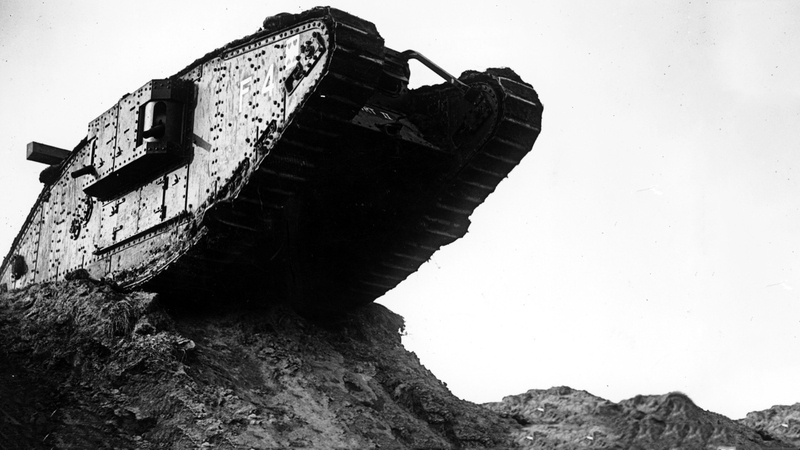 Raging from July 28th 1914 to 11th November 1918, this hellish conflict was the world’s first truly modern war, characterized by the widespread use of tanks, aircraft, heavy artillery and poison gas. So intense was the fighting it is said that, during particularly heavy clashes, the thunder of guns could be heard echoing as far away as London. Leaving Europe with deep physical and psychological scars, the Great War claimed a grand total of 16 million lives and left a further 21 million injured. 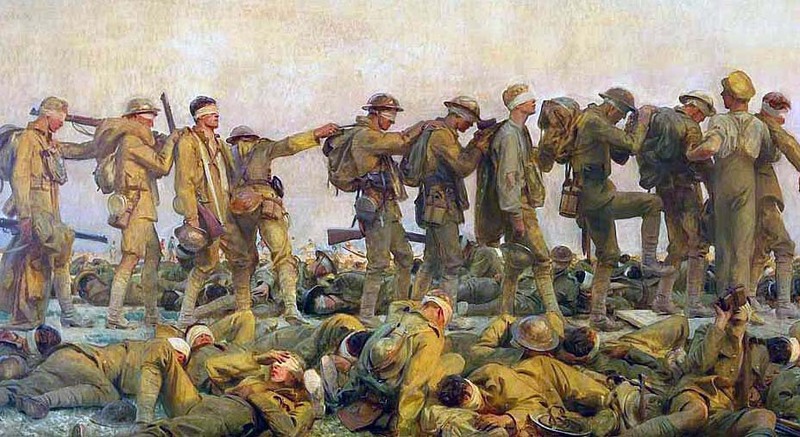 ‘Gassed’ by John Singer Sargent, 1919. This painting is part of the Imperial War Museum’s collection. On a personal level, my Great Great Grandfather- who was also named Robert- was shot at the Battle of Passchendaele in 1917. Although he was lucky enough to survive (had he not, I would not be sitting here writing this now), the bullet he took remained in his body for the rest of his life. Wounded soldiers at Passchendaele, Belgium, 1917. 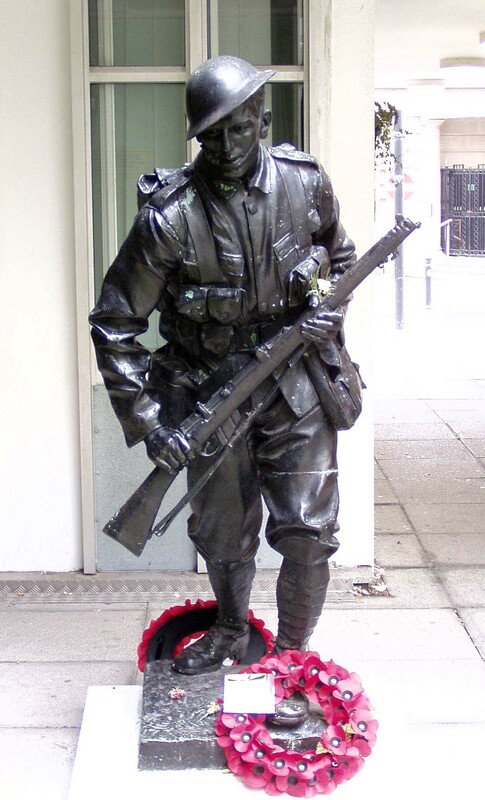 To mark this sombre landmark in our relatively recent history- and as my personal tribute to all of those who died, whatever their nationality- I have decided to start a new series which, over time, will take a look at London’s many World War One memorials and the stories behind them. I shall begin with ‘The Machine Gun Corps’ memorial. 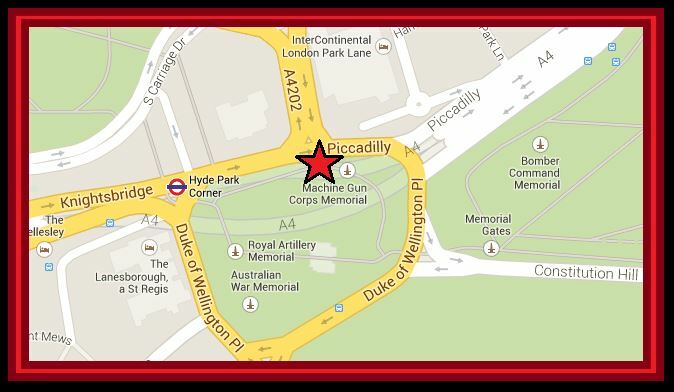 Location of the Machine Gun Corps Memorial at Hyde Park Corner (image: Google). After a few bloody months on the Western Front, it soon became clear in which direction the conflict was heading, leading to the formation of the Machine Gun Corps in October 1915. 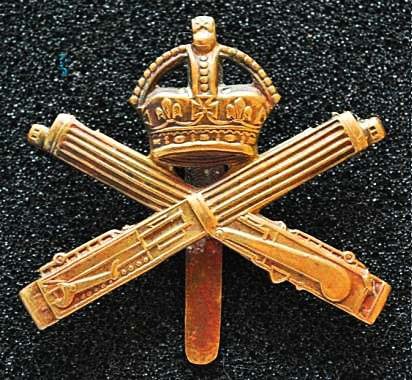 Machine Gun Corps badge (image: Wikipedia). During WWI, the Machine Gun Corps were deployed in a wide range of theaters including France, Belgium, Palestine, Egypt, East Africa and Italy. Because of the nature of their weaponry, troops from the MGC often fought well beyond the front line; a factor which earned the Corps both a high casualty rate and a darkly comic nickname… ‘The Suicide Club’. 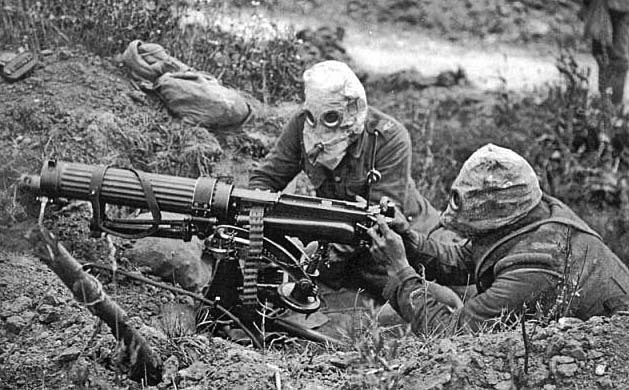 Gas masked troops from the Machine Gun Corps at the Battle of the Somme, 1916. Seven members of the Machine Gun Corps were awarded the Victoria Cross; the highest possible accolade for bravery. 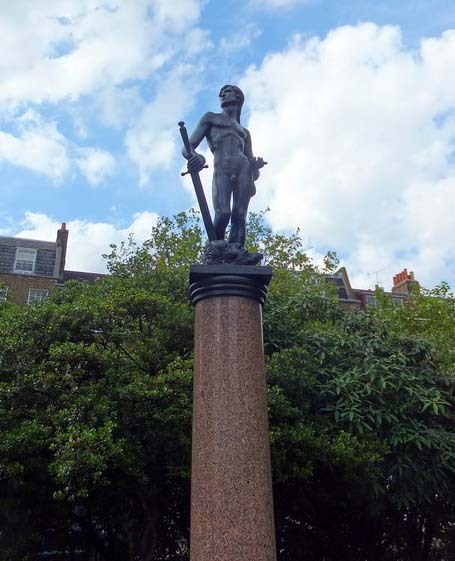 Unveiled in 1925, the memorial to the fallen of the Machine Gun Corps is embodied by a statue known as the ‘Boy David’; the Biblical figure who proved his worth after slaying the fearsome giant, Goliath. The ‘Boy David’ Machine Gun Corps Memorial. 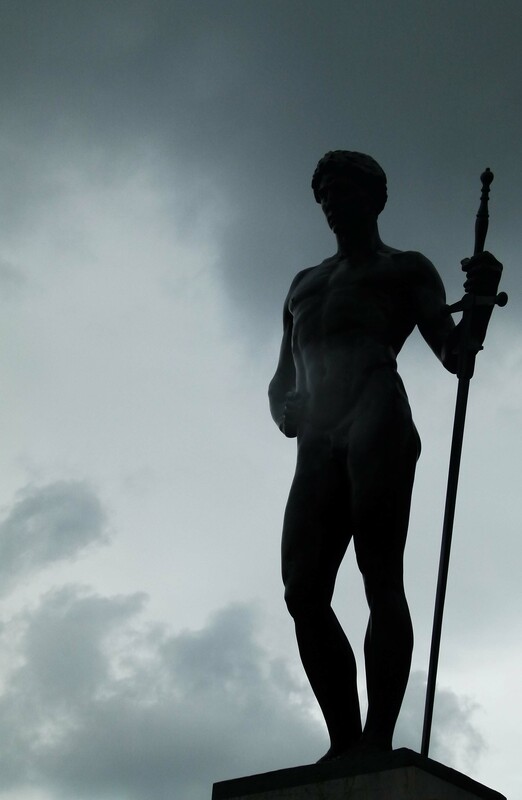 Although we tend to associate David with heroism and triumph over adversity, his representation in this case is naked; something which suggests a sense of vulnerability. The statue’s plinth includes a quote from the Book of Samuel; “Saul hath slain his thousands but David his tens of thousands”; a grim nod to the impact which the Machine Gun Corps had on the course of the war. 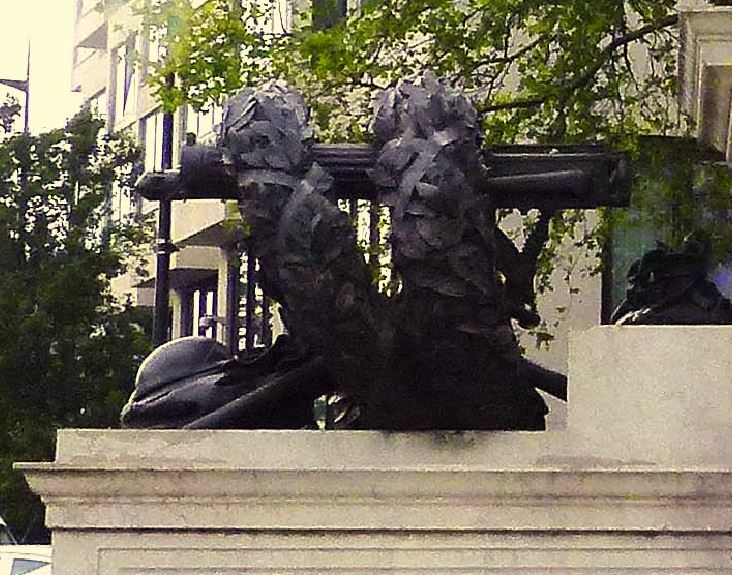 On either side of the statue sit two ‘Vickers’ machine guns, each encircled with laurel wreaths. These fearsome weapons are actually real models… so it is some comfort that they are now encased in bronze. “The Machine Gun Corps of which His Majesty King George V was Colonel in Chief, was formed by Royal Warrant dated the 14th day of October 1915. The Corps served in France, Flanders, Russia, Italy, Egypt, Palestine, Mesopotamia, Salonica, India, Afghanistan and East Africa. The last unit of the Corps to be disbanded was the Depot at Shorncliffe on the 15th day of July 1922. 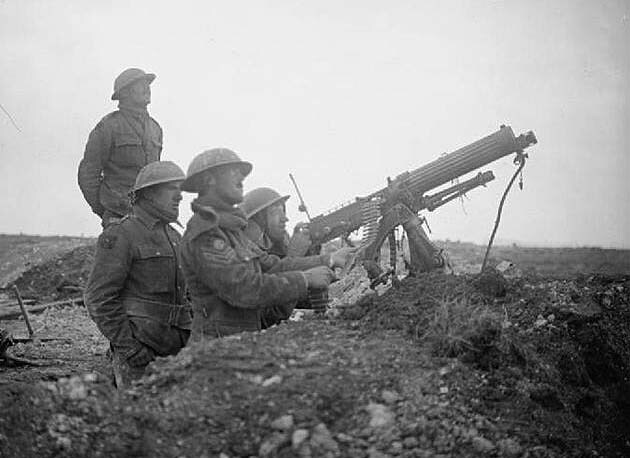 Machine Gun Corps troops at Arras. When first erected, the memorial stood on Grosvenor Place; just south of Hyde Park Corner. 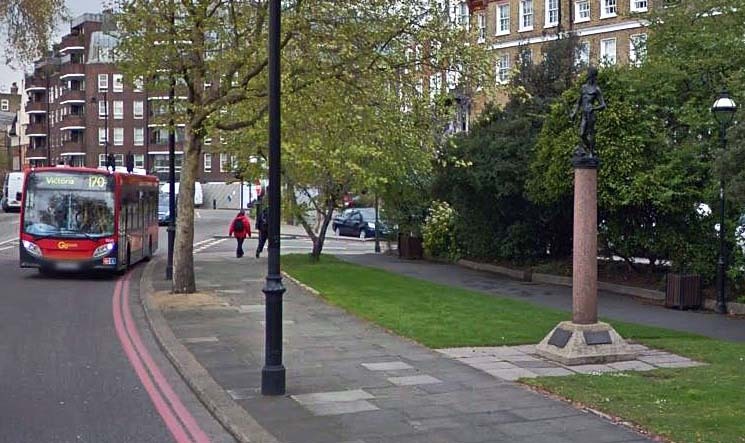 This first site was short-lived, with major road works soon requiring the statue’s removal. 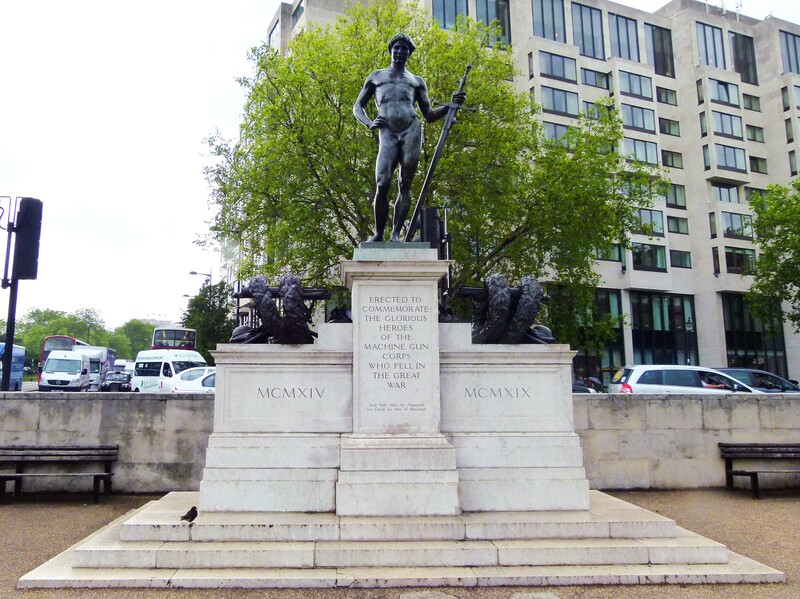 It was placed in storage for many years, finally returning in 1963 when it was placed at its present site on the northern side of Hyde Park Corner, backing onto one of London’s busiest road junctions. 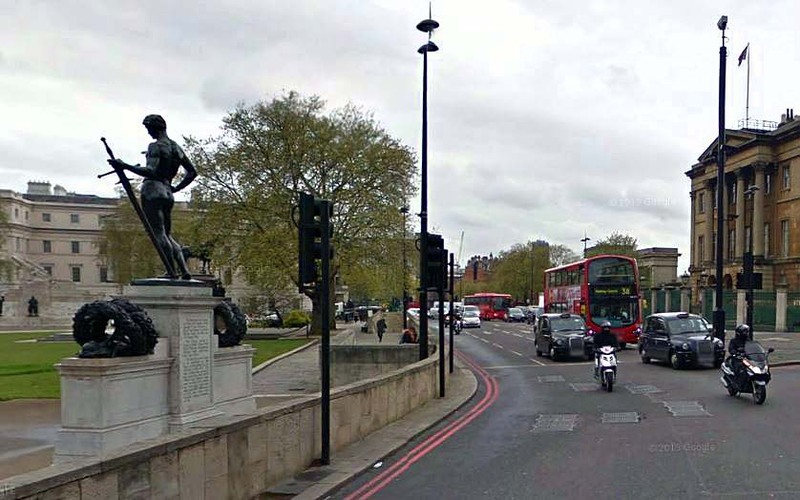 Looking towards the memorial at Hyde Park Corner (image: Google). An annual observance is held at the statue on the 2nd Saturday of every May. Perhaps the most poignant factor about the Machine Gun Corps memorial is the story behind its sculptor; Francis Derwent Wood. Francis Derwent Wood was born in the Lake District in 1871 and went onto teach sculpture at the Glasgow School of Art. When war broke out in 1914, he was too old for military service, so volunteered to work in the bustling hospital wards, coming to be based at the 3rd London General Hospital in Wandsworth. The 3rd London General Hospital. 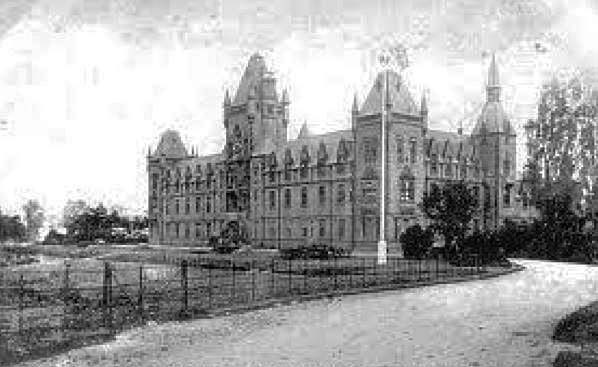 Originally built in the 1850s as a home and school for orphans, this grand building was requisitioned in WW1 for use as a military hospital. To cope with the sheer number of wounded troops being brought it, a temporary platform and station were built on the hospital’s western side (which backs onto one of the main lines into Clapham Junction). A field behind the hospital (which is today a cricket ground) became an overflow area, lined with row after row of marquees standing in as temporary wards. 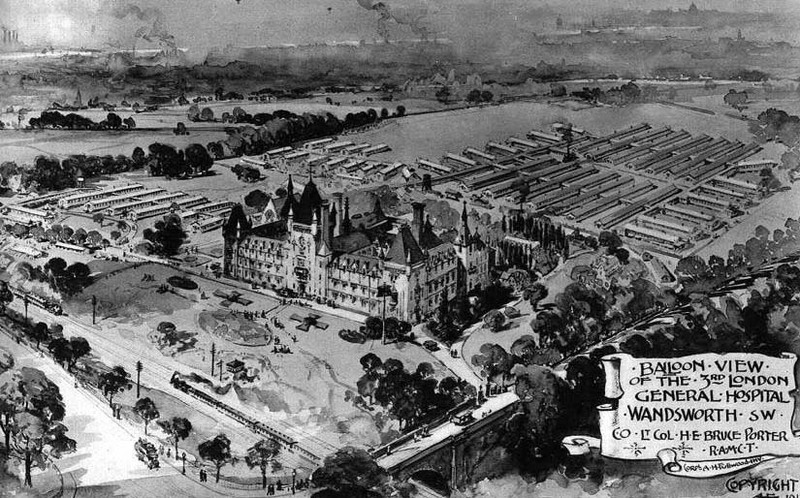 Postcard displaying the 3rd London General Hospital, Wandsworth. The railway lines which delivered wounded troops can be seen to the south, the overflow tent-wards towards the north. Today, the former hospital is now known as the ‘Royal Victoria Patriotic Building’; a complex of apartments, workshops, studios, a drama school and a restaurant called ‘Le Gothique’. 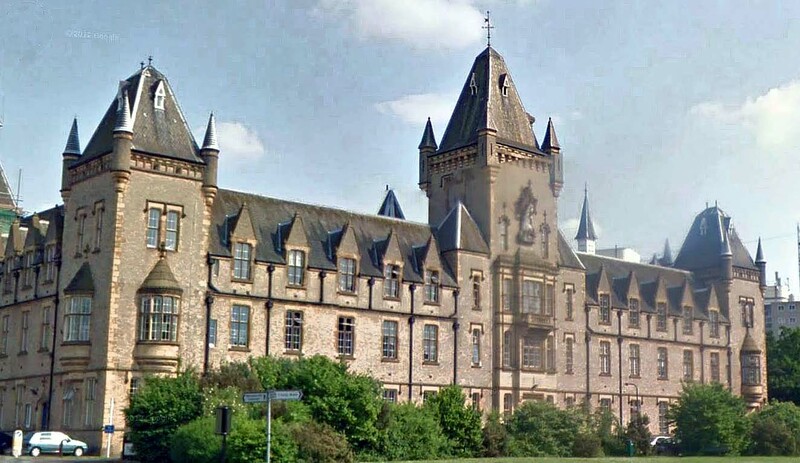 The former 3rd London General Hospital today… now known as the Royal Victoria Patriotic Building (image: Google). At the 3rd London General Hospital, Francis Derwent Wood encountered many young men who had suffered horrific injuries inflicted by the terrifying new weaponry. 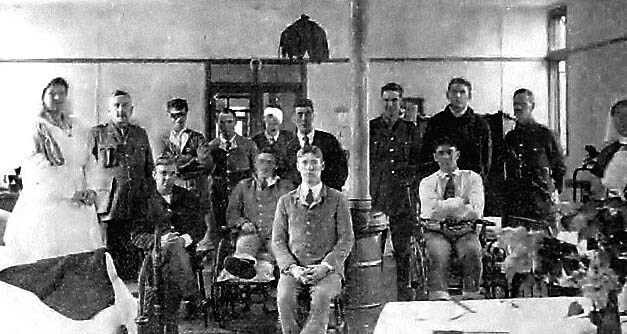 Canadian patients at the 3rd London General Hospital, Wandsworth. 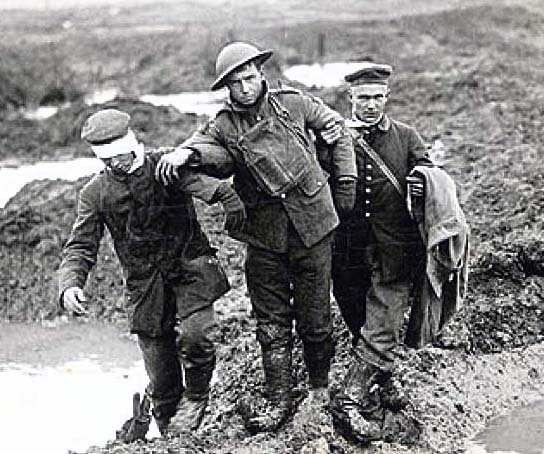 Facial traumas were especially commonplace; if a squaddie quickly popped his head over the trench, an unexpected explosion or burst of enemy fire could have catastrophic results. In some cases, victims literally lost half their face… yet somehow managed to survive. Although plastic surgery techniques were being pioneered at the time, there were some unfortunate souls who even this could not help. Exposed to such tragedies, Francis Derwent Wood had a brain-wave. 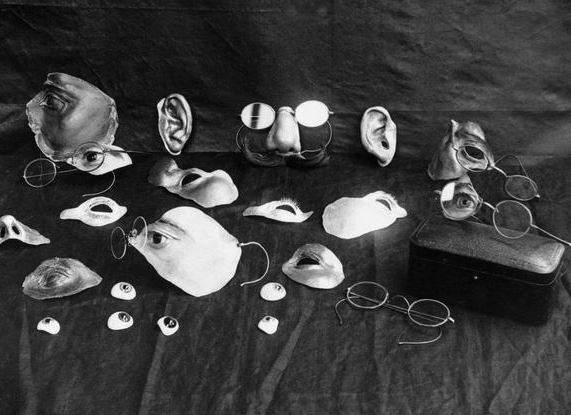 Realising that his artistic skills may be able to help those with extensive facial scars, he took it upon himself to set up the ‘Masks for Facial Disfigurement Department’ within the hospital where, beginning in March 1916, he began to use his expertise to create custom masks for his patient’s shattered faces. 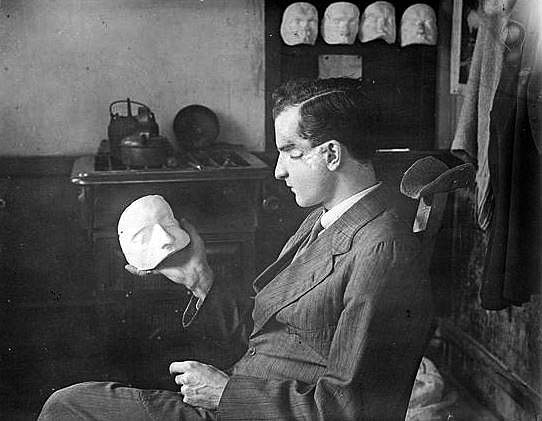 Francis Derwent Wood working on a patient’s mask (image: The Imperial War Museum). Taking up to a month to create, each mask, which was made from ultra-lightweight metal and painted in enamel to match the wearer’s skin tone, was a work of art in itself, designed to fully disguise the affected area. Where eyebrows and moustaches were required, slivers of tinfoil were used- rather like the technique used on ancient Greek statues. Bits and bobs from Derwent Wood’s ‘Tin Nose Shop’ (image: The Imperial War Museum). This creative solution did wonders for the morale of young men faced with a future of horrified stares and social exclusion- in Sidcup for example, which was also home to a facial hospital, certain park benches were designated for the use of patients…and were painted blue as a warning to passers-by of a more sensitive nature. 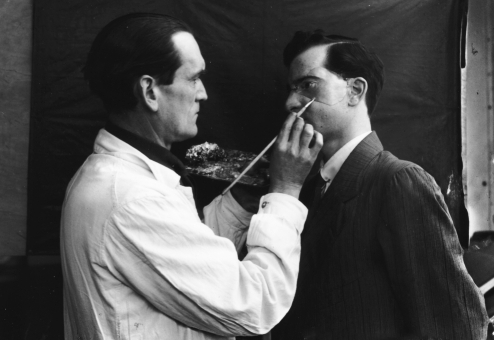 A wounded soldier examining the beginnings of his facial mask (image: The Imperial War Museum). Derwent Wood’s work was soon noticed by the American sculptor, Anna Coleman. 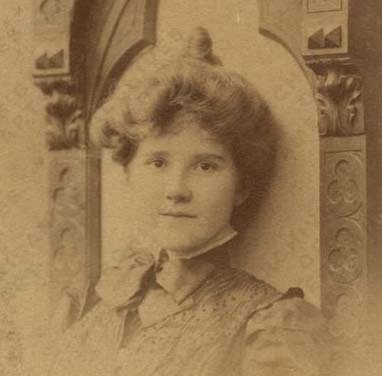 After liaising with Derwent Wood and with support from the American Red Cross, Anna opened her own mask studio in Paris, where she continued the pioneering work on severely wounded French and American troops. Unsurprisingly, Anna Coleman and Francis Derwent Wood received many grateful letters from those they’d helped. 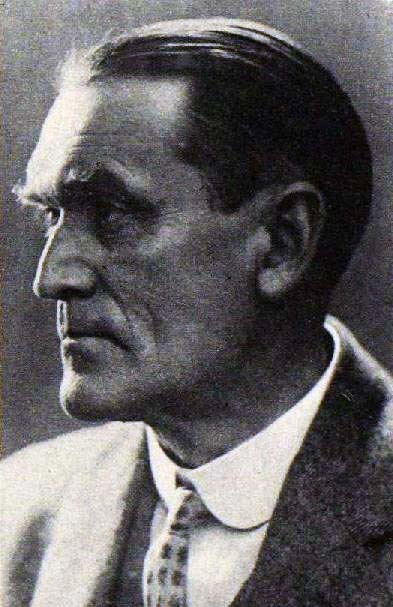 Francis Derwent Wood’s studio was wound down in 1919. Although he was able to help several hundred men, this was a mere drop in a very sad ocean- over 20,000 would return from the continent with facial wounds. 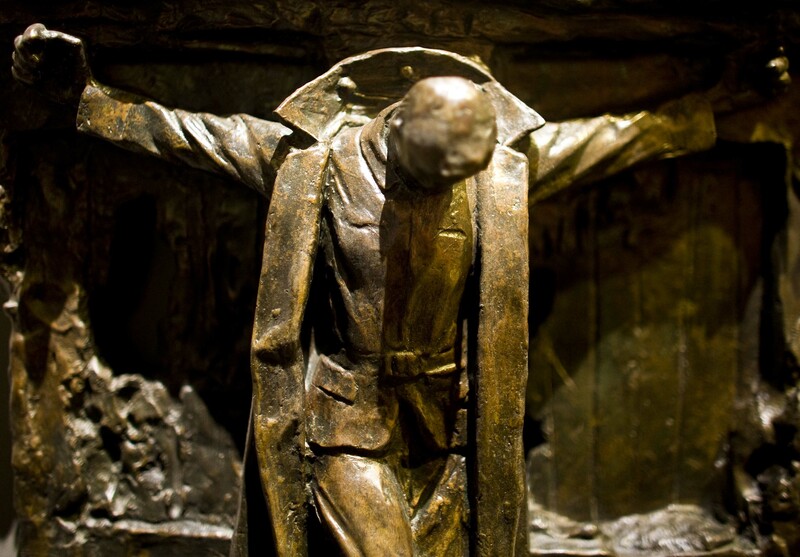 After the war, Francis was commissioned to create memorials in honour of the men who never returned. These works include a statue for Liverpool’s Cotton Association, ‘Humanity Overcoming War’ in Bradford and work on the memorial plinth in his home town of Keswick. Francis Derwent Wood’s sculpture for the Liverpool Cotton Exchange (image: Wikipedia). He also created a controversial sculpture of a crucified soldier; ‘Canada’s Golgotha’ which can be seen in the Canadian War Museum, Ottawa. London’s Machine Gun Corps memorial was one of Derwent Wood’s last pieces. He died just two years after its unveiling. In 1929, a small, bronze copy of the Boy David was made by Edward Bainbridge Copnall as a memorial to Francis Derwent Wood. 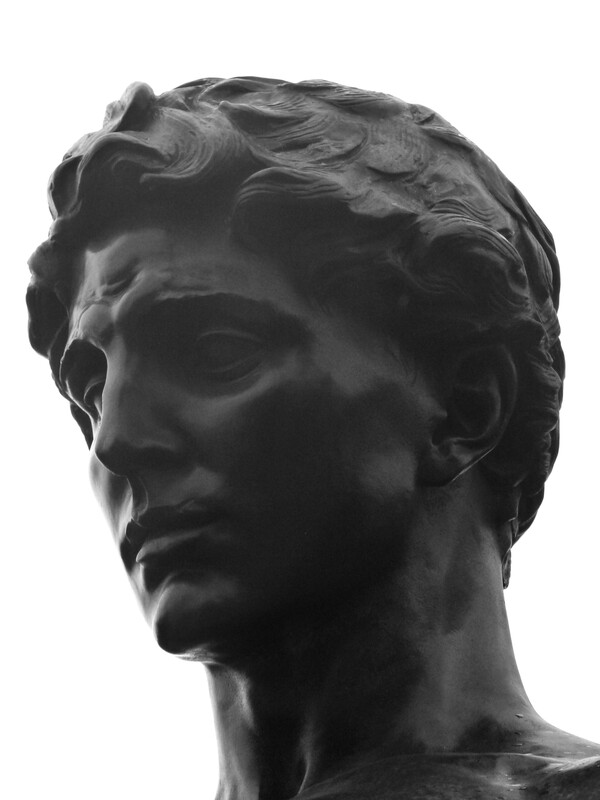 The Boy David modello by Edward Bainbridge, 1929 (image: Copyright Paul Farmer, via Geograph). Bequeathed by the Chelsea Arts Club, it can today be seen on the north side of Chelsea Embankment, overlooking Albert Bridge. Wow! Thank you so much for taking the time and trouble to write these. I enjoy them all and naturally have a favourite. Every time I think that’s it, that’s my favourite, it won’t get better than that it does. From Dr Salter, to The Waterloo Ring, to Crystal Palace park, to Secrets of the viaducts. And now a new favourite! You bring points to life. I wondered what the Royal Victoria Patriotic Building had been originaly when I pointed it and meant to look it up one day. Who knew it would have such a sad, interesting and yet uplifting history. The statue in Chelsea Embankment Gardens was another revelation. Must get off the bike and take a proper look one day. Seen on facebook, this guy’s request that everyone plants a packet of poppy seeds in 2013 so next year is awash with poppies everywhere to mark to 100th anniversary. Thanks for this great article!! Very interesting! Do you know which foundry made the memorial? That’s a very good question… unfortunately I don’t know the answer. If I come across the info, I’ll let you know. A super and very touching article, thanks for sharing. That’s very kind, thank you. Thank you so much for this. As said, beautifully written and researched. Those masks are remarkable. They give credence to their use in the drama series Boardwalk Empire. Only the dead have seen the end of war. Sadly. Thanks again and be lucky. One of my favorite war memorials are the unusual wall mounted tablets in Cyprus Street, Bethnal Green. I remember stumbling across them one cold Sunday morning. I stepped off my C90 to read the scriptures, proudly mounted between two terraced houses and meticulously maintained. Just one more memory on the joy of discovery, that is the KOL. My great uncle was killed whilst serving in the Machine Gun Corps. I have travelled to France to visit his grave and pay my respects and I visited the MGC memorial in Albert, but didn’t know about this one, or the ceremony in May. Thank you fir this excellent article. Thank you for your kind words, Gill. Your Great Uncle made a supreme sacrifice. I hope you are able to visit the memorial soon. This was an amazing article. I was doing some research for a story I wanted to write and this article just made me pauze for a second. I am now determined to include Francis Derwent Wood in it, he was an amazing man. Canada’s Golgotha is a haunting piece! Dear Sir, my grand father James Lamont Smart served in Ypres in 1917. He was condecorated by His Majesty George V with the Military Cross. I would love to travel for the centennial to the battlefields in France / Belguim but I dont know exactly where and when I have to go. Any onformation I will appreciated. Rafael Smart from Patagonia, Argentina. Many thanks Rafael and much respect to your Grandfather. There are a number of companies who offer tours such as this one:https://www.toursbylocals.com/Ypres-Tours?gclid=CMW-oOrMo9MCFfYy0wodruYI5A Hope that helps and good luck in your quest. Thank you for all the information.My Grandfather Hubert Croughan Enlisted in the Connaught Rangers in 1915 and transferred to the Machine Gun Corps. He was wounded on Easter Monday 1917 at Arras losing a leg. Thank you for sharing your Grandfather’s story, William.